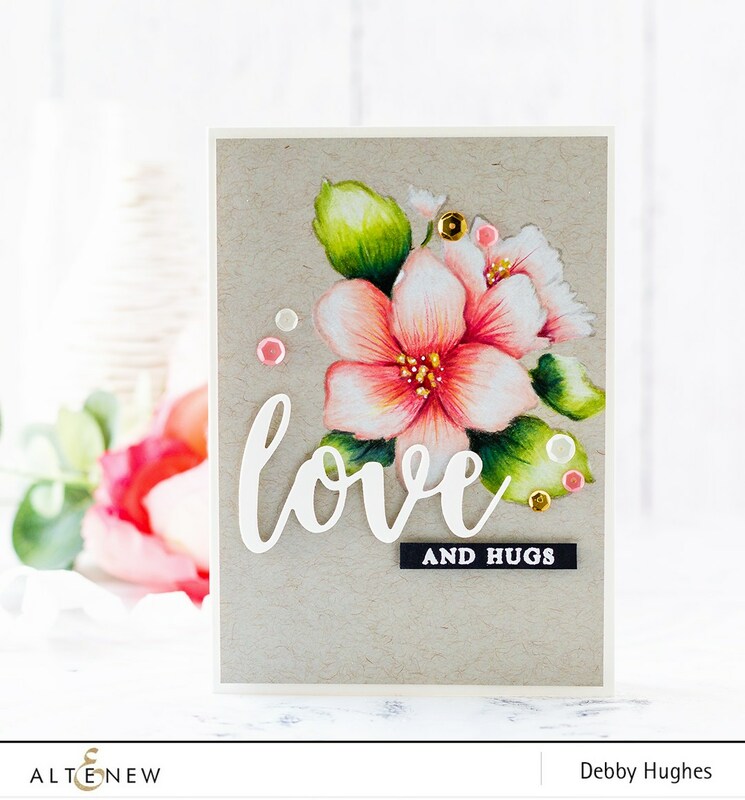 Looking ahead to spring, I wanted to make a simple card for Altenew's February Inspiration Challenge, which features a beautiful floral bouquet. Although I'm not proficient with colored pencils, I thought this was a good opportunity to hone my skills. This was a pretty bold attempt on my part, considering that the inspiration was a gorgeous card by the amazing Debby Hughes, but I stamped and colored on! 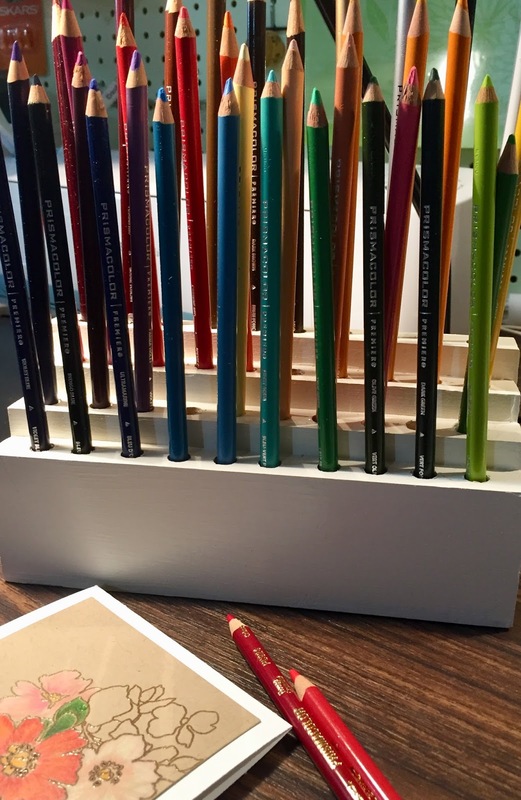 Besides, I've been looking forward to using the awesome pencil holder that my hubby made for me! 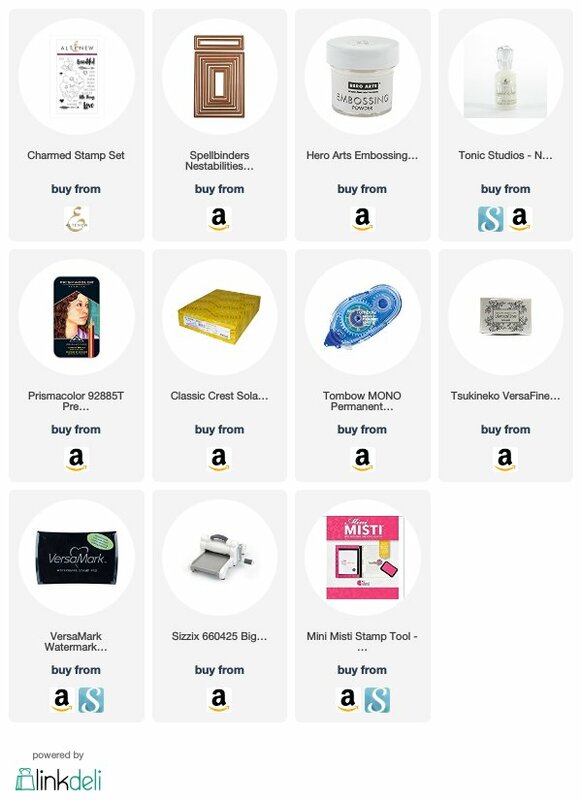 To begin, I cut a piece of Gina K Designs Pure Luxury kraft cardstock to 4.25 x 5.5. I then stamped the floral image from Altenew's Charmed stamp set using Versamark ink and heat embossed the image with clear embossing powder. Using Prismacolor pencils in Poppy Red, Carmine Red, and Crimson, I colored the largest flower. I wanted the smaller flowers in shades of pale coral, but since I didn't have that color in my collection I decided to use some peach tones. The smallest flower was actually done in Cream and Light Peach.This is where I felt my pencil coloring skills needed a little practice. Since watercoloring is something I've done much more, I'm used to leaving white space for highlights. I'm going to try to do that more with my pencil coloring and see if I like that effect better. The leaves were easier to color, just a touch of Apple Green with some shading done in Dark Green. I used Goldenrod for the centers and added a tiny bit of black to the seeds. 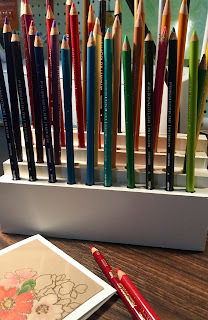 Once the coloring was done, I stamped the large sentiment directly on the paper using Versafine Onyx ink (my favorite for just about anything except alcohol markers), then heat embossed it in clear embossing powder. 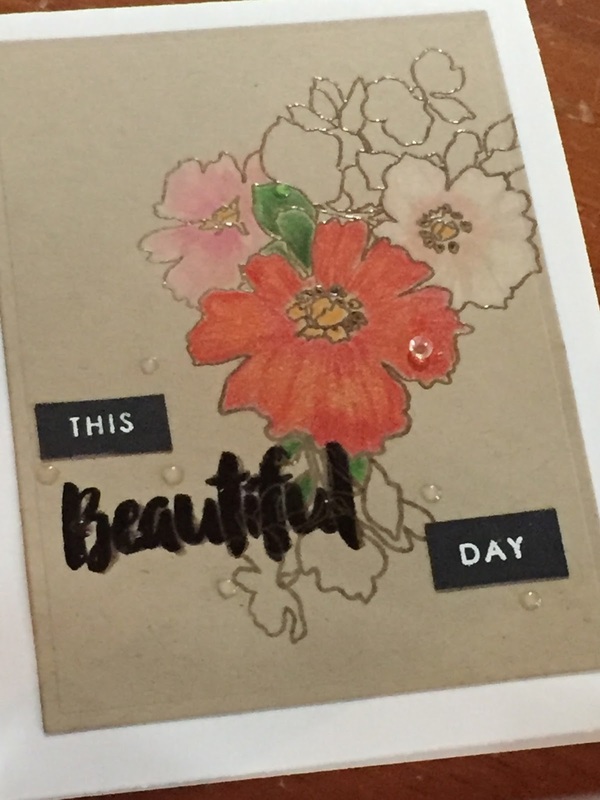 I kind of like the way the original outline of the floral bouquet shows through the sentiment, but if you didn't want that to happen it would be easy to just brush away a section of the embossing powder before heat embossing the bouquet. 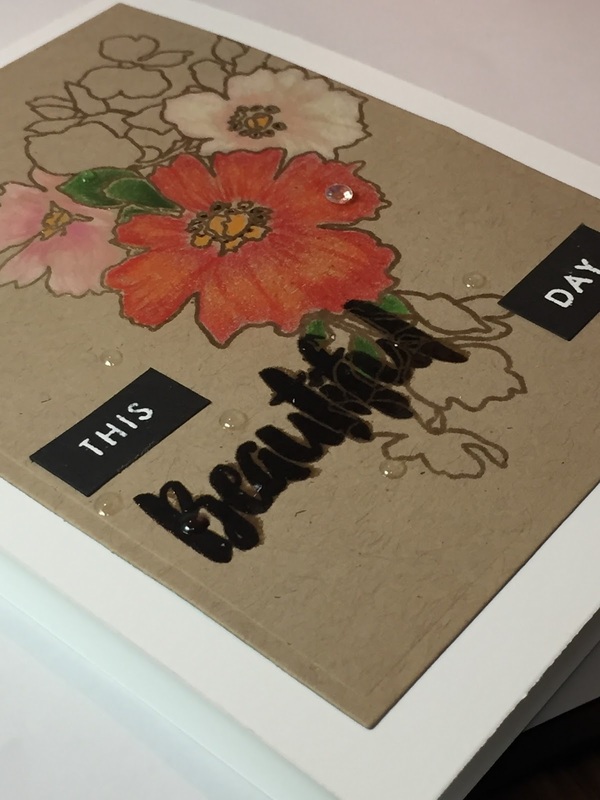 I stamped the smaller sentiments on a small piece of Gina K Designs Black Onyx cardstock then heat embossed with white powder before cutting them and adhering with Tombow Mono adhesive, another favorite of mine. 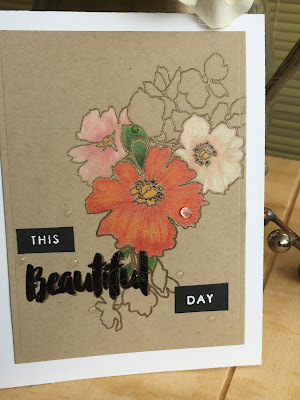 To finish, I cut the kraft panel using a Spellbinders Card Creator die, which gives it a nice, embossed edge, then adhered it to Neenah cardstock with my Kokuyo dotliner. I think it would also look nice popped up with some foam strips or even a sheet of kraft foam. I added a few Nuvo Crystal drops and a single jewel from Little Things Rainbow Sparkle mix just for fun. How wonderful! 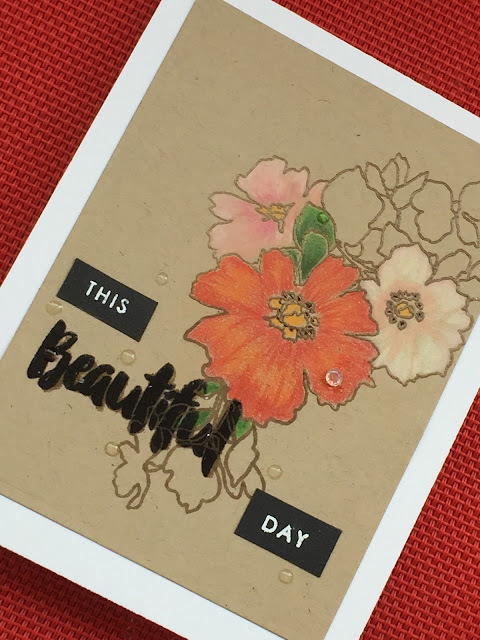 Love that you left some of the image as line art, it really adds so much to the overall card design by highlighting only the flowers and some of the leaves!